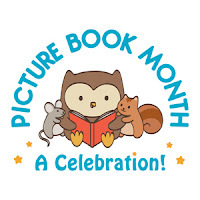 November is Picture Book Month. In honor of the occasion we've reviewed beautiful picture book to share with young readers this month. Many classes in my elementary school, from Kindergarten through fifth grade, study countries from around the world. Examining architecture is a fascinating way to explore similarities and differences between cultures, so I was eager to get my hands on If You Lived Here: Houses of the World. The illustrations are definitely the main event in this nonfiction picture book. 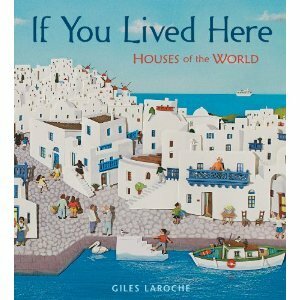 Laroche uses bas-relief cut-paper collage to illustrate homes from different parts of the world. Each two-page spread features a home and its surroundings. The inhabitants of the home are pictured outside taking part in chores or recreational activities. The layers of paper in different colors and textures add a depth to the illustrations that make them feel three-dimensional at times. A paragraph describing what it would be like "If you lived here..." accompanies each illustration. Facts about the type of home, material, location, and time period are located in the same text box. "If you lived here, you would step directly from your front door onto a boat to go to school." The 15 dwellings described in the book include a stilt house from Chile, a chateau from France, and a Yurt from Mongolia. It would be helpful to readers if the location of each home was printed in bold print or used as a heading on each page. As I was savoring each intricately crafted collage, I wanted to know: What is the location of this home? I had to read through a page of small print to figure out the location. This won't be a problem for older readers (grades 3-5), but it may prove difficult for younger readers. A map in the back of the book matches the homes to the region of the world. Children may want to compare book to a world atlas since countries or continents are not labelled on the map in the book. Europe and North America are heavily represented in the book; South America and Africa are each represented one time (stilt house from Chile and decorated house from South Africa). Children will enjoy the amazing illustrations in If You Lived Here, and teachers will want to read it aloud as part of social studies or art classes. This is a book that you can read again and again, and each time you'll notice something new. It could serve as a starting point for discussions about culture and how people live in different parts of the world. OOh, I'd love to see a copy of this book, the front cover looks gorgeous. I love books about houses; now if I could just remember the book from my childhood about houses from different generations. The cover of this is especially nice.